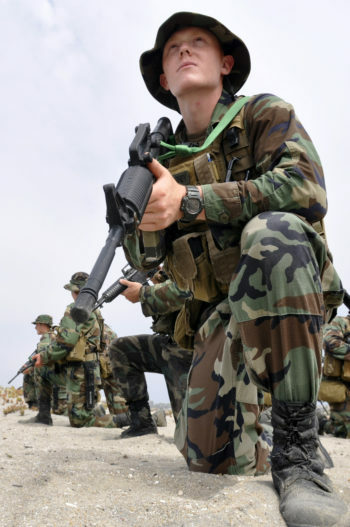 In the military, your watch is the only piece of gear you wear every single day. And that’s why you should invest in a great one. Because you need a watch that you can trust. A watch that’s insanely tough and reliable. A watch that will go to hell and back with you. That watch is going to be a G-Shock. And all packed with different features? We’ve done the work for you – and as you’ll see below, it’s not all that difficult. 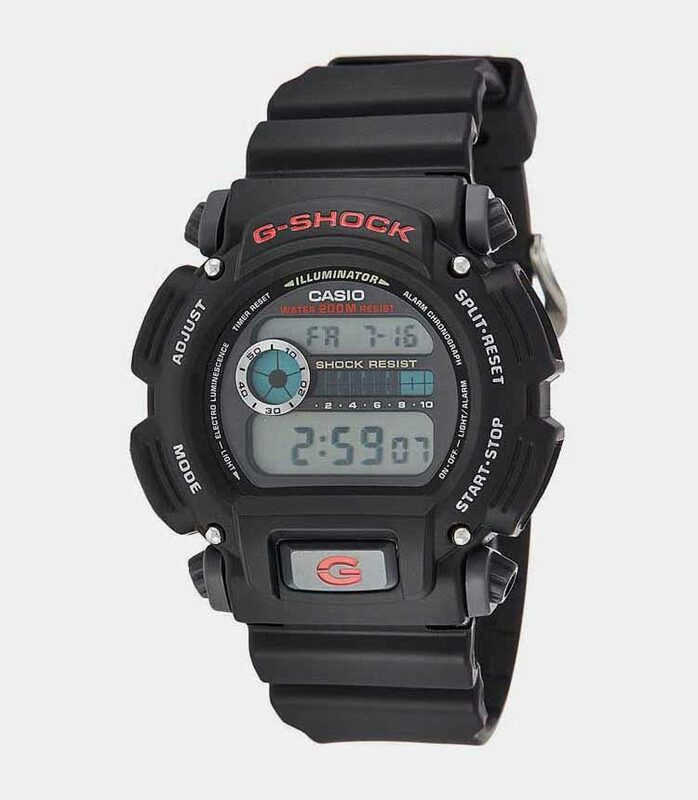 Because Casio makes a number of G-Shocks that with military-specific features built into them. We did the research and picked out the best tactical G-Shocks out there. Best Overall: If you want the best military G-shock on the market, then you’ll love the G-Shock Rangeman GW 9400. It’s packed with advanced features (triple-sensor, Tough Solar, atomic clock etc.) 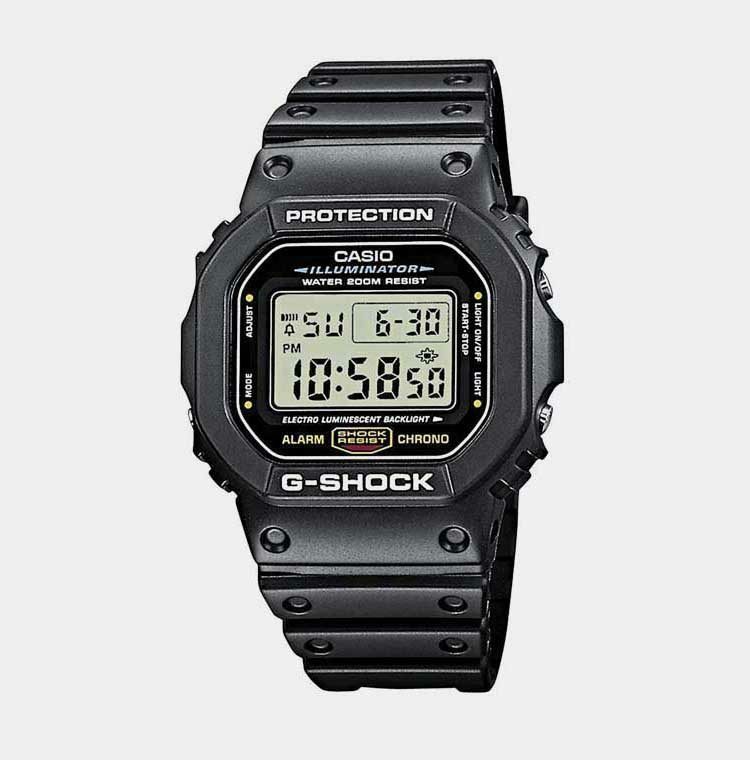 but costs less than other G-Shocks in Casio’s premium line. The Toughest: Some G-Shocks are tougher than others. In particular, the G-Shock “Mudman” line that has extra protection around the caseback and the buttons. Check out the Mudman G9300 that comes with a twin-sensor (compass & thermometer) or the more affordable Mudman G9000 – both great, durable, and tough G-Shock watches. Budget Pick: Check out the G-Shock GD 350 if you’re looking for the best military G-Shock under $100. 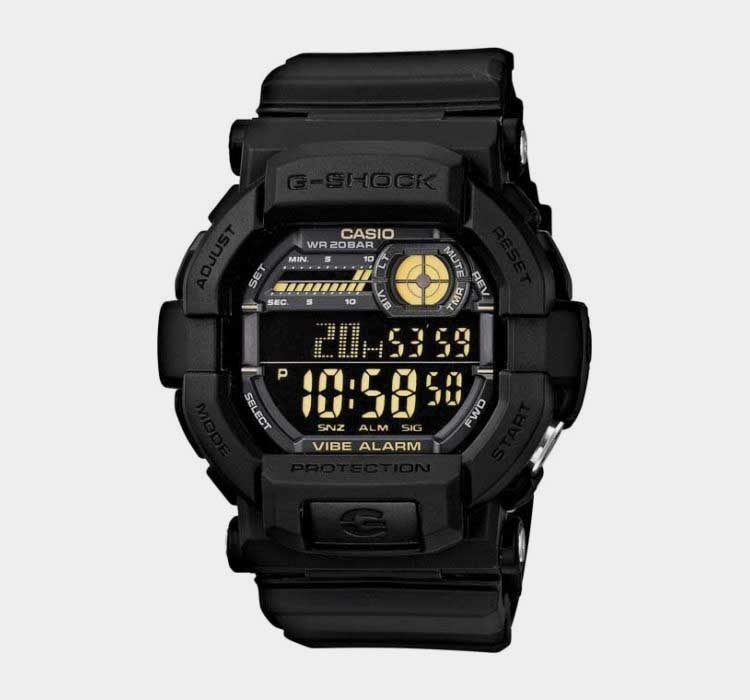 GD350 is a watch that Casio built specifically for military use. 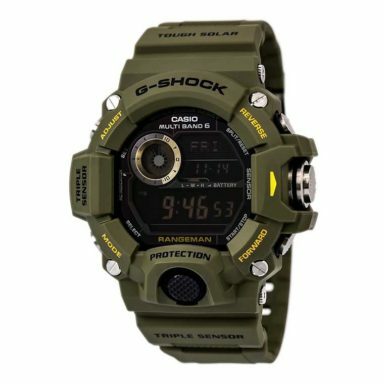 It comes with unique military features that other G-Shocks don’t have – vibration alarm, separate timer button etc. Cheap & Basic: Finally, if you want to spend the least amount possible – you’ll love G-Shock DW-5600 and G-Shock DW9052. They’re your basic no-frills-attached models that will get the job done. Or stick around to learn more about what makes a good military G-Shock. What Makes A Great Military G-Shock Watch? Because any G-shock will be “good enough” for tactical action. What more do you need for the military? Even the most basic G-Shock qualifies. These watches are built for this. Some G-Shocks better than others for military use. Advanced “survival” features – Tough Solar Battery, Compass, Silent vibration alarm, Thermometer, Barometer, Altimeter, Sunrise/Sunset times etc. But those are the most important tactical features that separate “the good” military G-Shocks from “the great” ones. And you’ll find them on the watches in this list. Finally a few words about the price. For the military, get a G-Shock that you’re not afraid to break. Yes, G-Shocks can take a beating. Most likely, you’ll never manage to break yours. But it’s a mental thing. If you have a $1,000 watch on your wrist, it’s hard not to worry about beating it up. There’s a world of difference compared to an $80 G-Shock. Or even a $200 G-Shock. This is the main reason that Rangeman GW9400 is the most expensive watch that I recommend. At ~$200 – give or take – it gives you amazing functionality without breaking the bank. Side note: Of course, this only applies if you care about your watch and money. I’ve never understood people who wear Rolexes on missions, but I assume it’s because they’re not afraid of busting up their $4,000 watch. OR don’t mind spending that amount of money on buying a new one. Rangeman GW9400 is one of the best tactical watches and G-Shocks out there. Casio calls it the “survival watch” because the GW9400 is top-of-the-line in functionality. Side note: You won’t be relying on the sensors in the military, but never hurts to have a backup. Time and sensor readings can be recorded – you get 40 data slots. With a press of a button, you can record the exact time of a key event happening. Or log temperature changes in your area. In other words, Rangeman GW-9400 requires ZERO maintenance. Like any advanced G-Shock, the Rangeman comes with five alarms. Sunrise/Sunset time indicator is another neat feature that I find myself using a lot. Perfect for timing my evening walks, especially in winter months. Big buttons are easy to press when wearing gloves. Dedicated backlight button at the front. Button sounds can be muted. P.S. If you want to see the Rangeman in a military environment, check out the user photos in Amazon reviews. There are some great shots there. You’re looking at the best military G-Shock on the market. And since Rangeman GW-9400 was first released in 2014, today’s price is way lower than it was back in the day. Watch the video below for a short review of its main features. 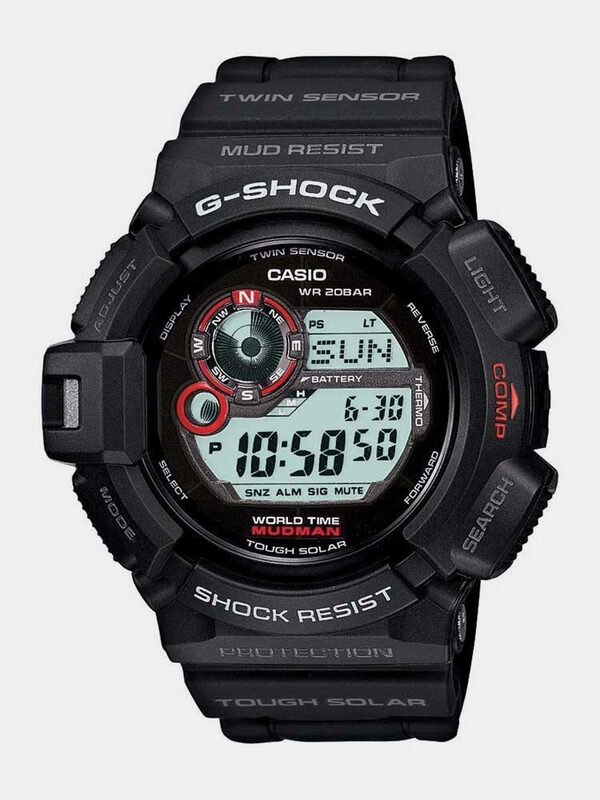 Side note: If you like the Rangemaster but want an analog display, check out the similarly-priced Casio GG-1000-1A3CR Mudmaster. What makes the GD-350 stand out from the rest of G-Shocks are the military-specific functions of the watch. GD350 has a dedicated timer button. You access the countdown timer with one quick press – right from the home screen. The timer has a dedicated screen right above the time display to the left. This is something that many G-Shocks don’t have. If you like to have your timer to be accessible without going through the functions menu – this is the watch for you. GD350 comes with a silent vibration alarm. You can have an alarm without giving away your location – whether to humans or wild animals. 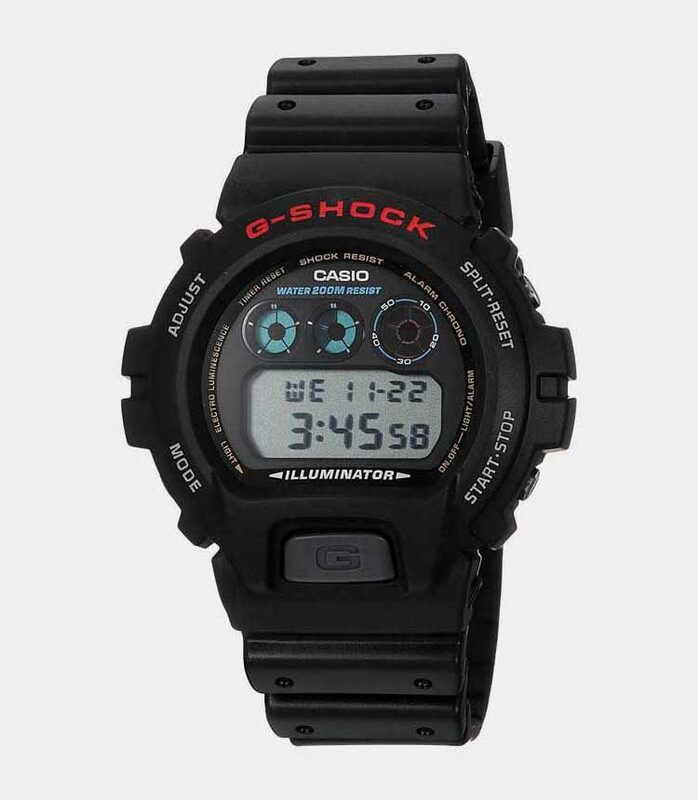 Again – the vibration alarm is quite rare and GD350 is the only G-Shock that I know of that has it. The GD 350 runs quite big at 51mm in diameter and 2.64 oz. in weight. GD350 is the best “military watch” from Casio. At below $100, it’s one of the best budget G-Shocks, period. P.S. We’ve done a full review on G-Shock GD350, taking a closer look at its vibration alarm feature. This construction gives the G9300 “Mudman” extra protection against water and mud. It also makes the watch tougher than other G-Shocks, as they’re not as well protected against mud. In addition to that, you get all the same “premium” G-Shock features that the GW-9400 Rangeman comes with – including a Tough Solar movement. 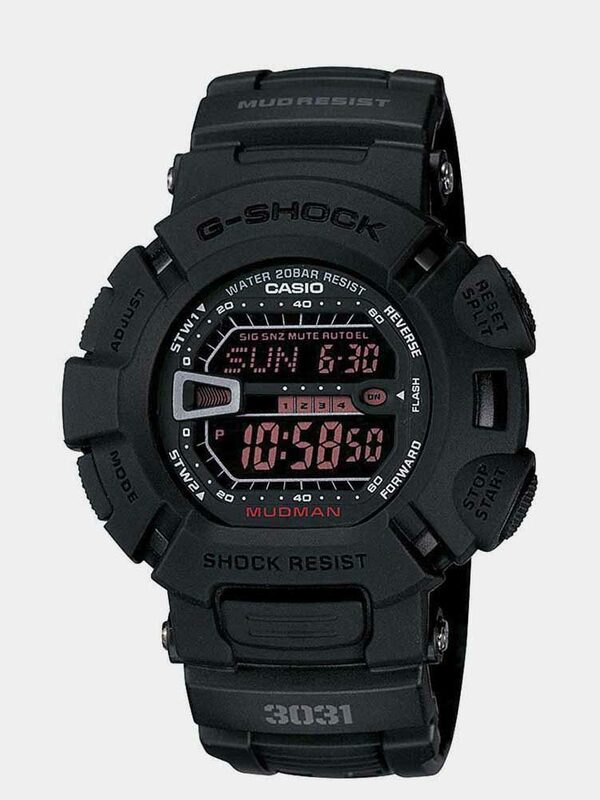 The only downside of the G9300 “Mudman” is the lack of the Multi-Band 6 atomic clock. But even without radio calibration, the +-15 second accuracy of the quartz movement will be enough for most purposes. What makes the G9300 “Mudman” attractive is its “bang for the buck” you’re getting. For a little above $100, you can get yourself a twin sensor watch with an extra-rugged construction. So while the G9300 is not the most advanced G-Shock on the market, it’s well worth the money. P.S. Want to know more? Read our full G-Shock Mudman Review. G-Shock G9000 is the “original” Mudman from 2006. It has the extra-rugged construction like its bigger brother G9300 above, but doesn’t come with the tough solar battery and the Twin Sensor. G-Shock G9000 is a military classic – and one of the best budget G-Shocks you can get. Extra-rugged construction, hands-free backlight, tactical design – what more could you ask for? G9000 gets the job done and countless servicemen swear by it. Personal opinion, but this is one of the best-looking G-Shocks out there. There’s just something about the “tactical” screen and the way that the features “pop” out at you from the case. STYLE. I love the black-white contrast on GA 100 1A1’s dial. Beautiful, but tough and rugged at the same time. This model is constantly selling at a discount. But even at its original price, it offers great value for what it costs. Side note: Mach calculator’s nice and dandy, but you won’t be using it out in the field. Same with magnetic resistance… chances are you will never need it unless visiting some kind of a research lab. You can use a dual time display to keep track home time when on deployment. Won’t have to pull a General Schwarzkopf to keep track of two timezones. World time is useful as always – switching between different timezones is effortless. There is no silent mode – but many of the sounds on the GA 100 series are disabled by default. It’s more silent than other G-shocks. You’ve got your hands-free backlight, but there is no dedicated backlight button in the front of the watch. The movement runs on battery – not solar. But at this price point, with the features that they’ve packed into this watch, we have nothing to complain about. If you’re looking for a budget military G-Shock with analog display, the GA100 is your watch. Otherwise – the GD350 will have better functionality for the same price. 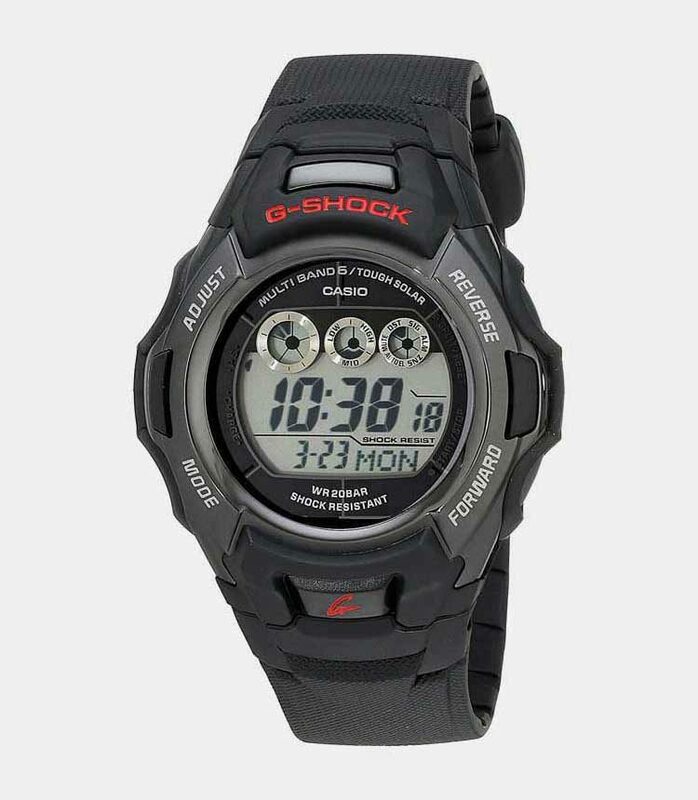 G-Shock GD400 is a cousin of the GD350. As you can see, protective bullbars around the watch are the main thing setting it apart from other G-Shocks. So The GD400 looks – and is – extra rugged. Side note: bullbars are not necessary unless you’re doing some outright crazy stuff with your G-Shock. The normal construction is enough to withstand general abuse. When it comes to features, GD 400 is not as good as the GD 350 above. Silent mode is the only military-specific feature that the GD-400 has. And frankly – if you ask me – the bullbars (that are not necessary in the first place) do not make up for the lack of functionality. As you can see – it’s a decent watch. You’re still getting quite a bit for your money. If they had included the GD 350 features in this one… It would have been a killer-watch. There are better military G-Shocks out there. 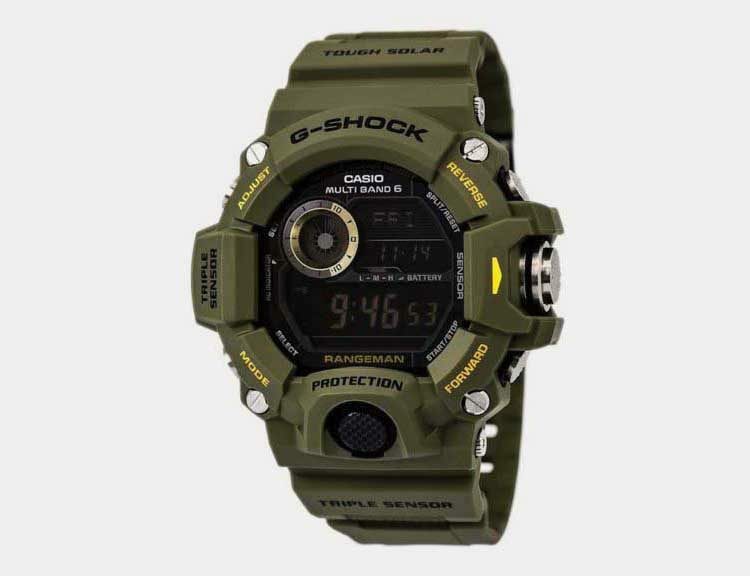 GD 400 looks like a military watch. And If you want a military-looking watch – go for it. But unfortunately, it just doesn’t have the military-specific functionality of its cousin GD 350 (Not to mention the #1 pick – Rangemaster). Otherwise, it would be higher up on the list. Wouldn’t you want to have a G-Shock that was actually used by Navy SEALs? G-Shock DW 6600 was the watch issued to Navy SEALs in the 90s. 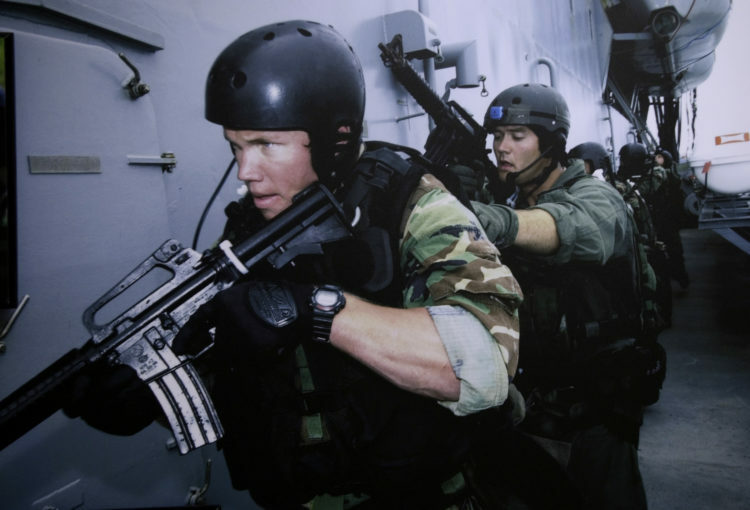 It replaced the Rolex Submariner as the official watch of the Navy SEALS. It’s easy to see why – the DW 6600 was more affordable and more reliable than a Rolex. Side Note: DW 6900 is the direct successor of the DW 6600 model. It’s the closest we can get new. The original DW 6600 is out of production, but you can find vintage pieces. This is your basic, affordable G-Shock watch. That’s because the design is from the 1990s. Many of the advanced features of G-shocks simply didn’t exist back then. At this low price point, we can’t expect more. As a daily beater that you’re not afraid to flush down the toilet – this watch is perfect. For advanced functionality – including military settings – you’re better off with one of the models above. You’re looking at one of the most affordable Tough Solar/Atomic Clock G-Shocks on the market today. That’s really the main selling point here. Compare that to the 52-53mm cases of the Rangeman or the GA100 1A1 above. Heck – even from looking at the image you can tell that this G-Shock looks smaller than the rest. If you want a smaller G-Shock that still packs a punch, this is the watch for you. For its size – this thing is packed with features. What more do you need from a basic G-Shock? I mean, I’d love to see some more features. But then I remember how small and affordable this G-Shock is. So there’s really nothing more to ask from Casio here. It’s a great little watch. 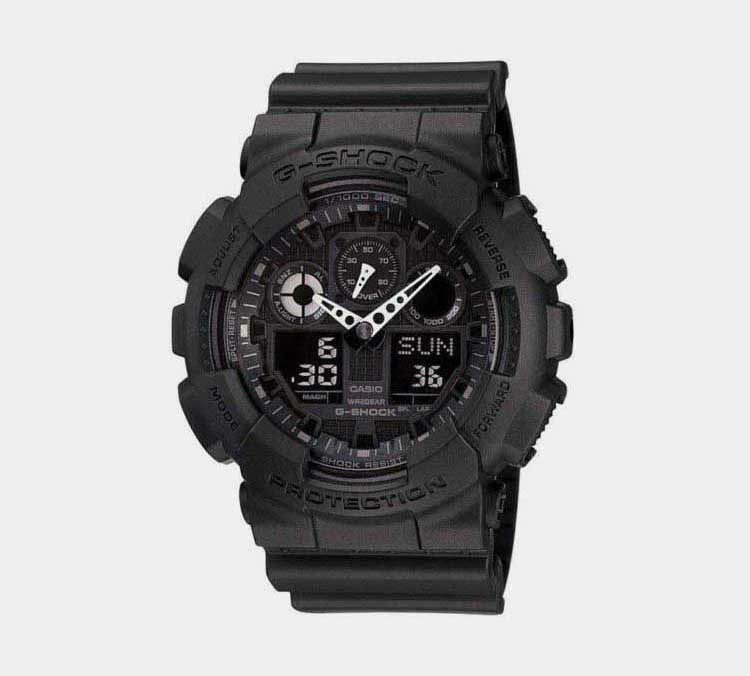 This is probably the most affordable G-Shock on the market, period. It’s affordable, rugged, and simple. Besides the price, there is almost nothing special about this watch. It’s about as basic as it gets. There is a cool timer display. See that bar in the middle of the watch? It’s constantly moving and counting seconds. The watch is quite large at 47mm in width and 2.08 oz. in weight. DW 9052 is as basic of a G-Shock as it gets. It’s a perfect beater watch. But as a military watch? You can do better with any of the above models. P.S. If you want to know more, we have a full review on G-Shock DW9052. I love DW-5600. It’s the basic square G-Shock. This is the original design of the first G-Shock released in 1983. It’s where the whole G-Shock line started. And being one of the smallest G-Shocks out there, it’s affordable and fits small wrists. What makes the DW-5600 special for me is that you can wear it in any situation. Google around and you’ll even see people wearing this classic square with a suit. So let’s move on to the features. You’re getting the basics with the standard, affordable version DW-5600 square. Nothing special – it’s your average beater G-Shock watch. Especially with the solar square, you’re getting great value for the money. 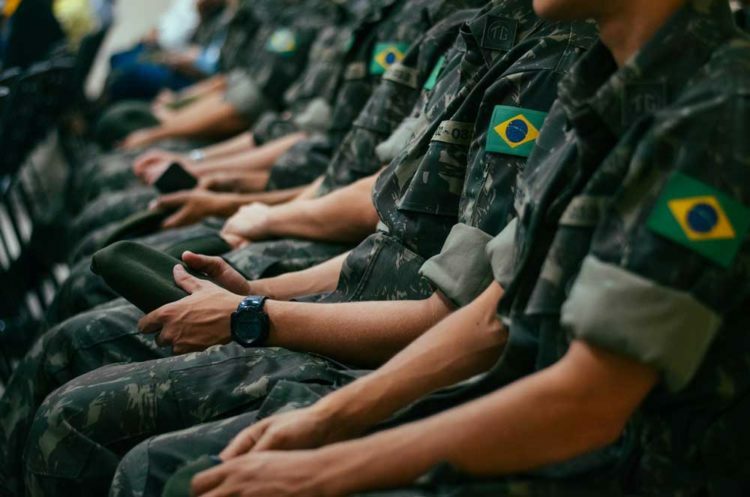 There are no strict regulations on wearing watches in the military. All you need to do is keep it simple and conservative. 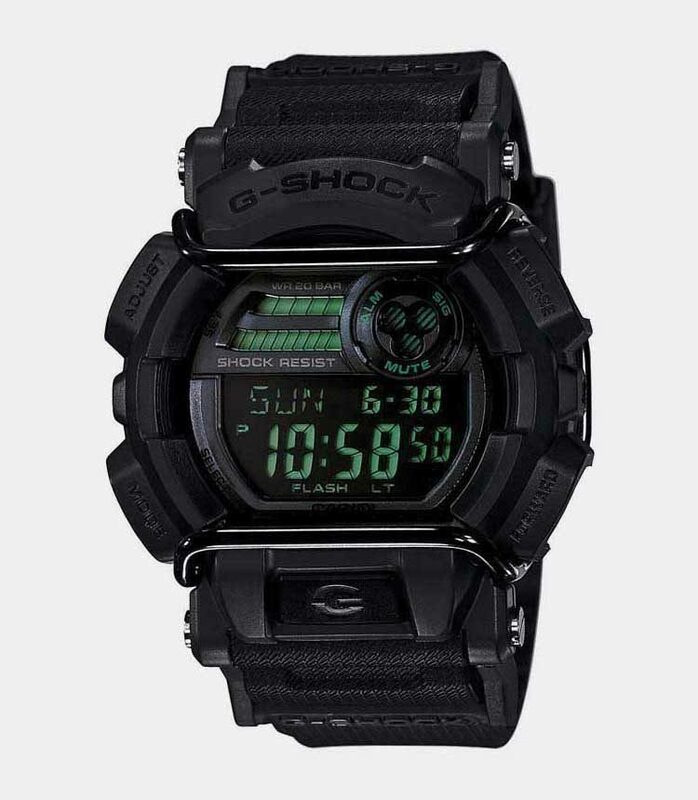 Any dark, solid-color G-Shock watch is acceptable for use in all branches of the military. G-shock is the perfect beater watch. 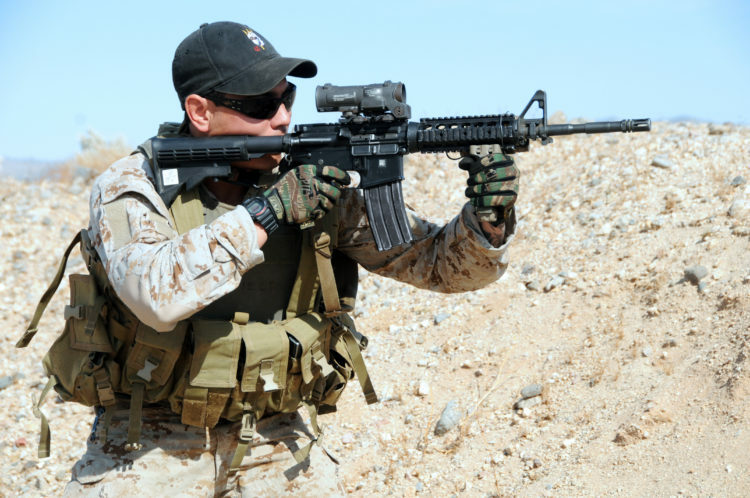 For less than $100 you can get yourself a military-grade tactical watch. Even $40 on a DW-5600 would be money well-spent. And you don’t even need to be in the military. G-Shock is a perfect watch to take hiking, hunting or fishing. Not to mention sports. There’s a 99.9% chance your G-Shock will never break. It’s built to last for decades. Do you have experience with using G-Shock watches for military? Please share them below in the comments!